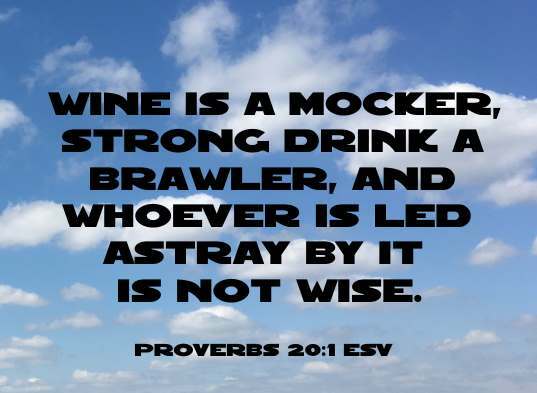 Wine is a mocker, strong drink a brawler, and whoever is led astray by it is not wise (Proverbs 20:1 ESV). 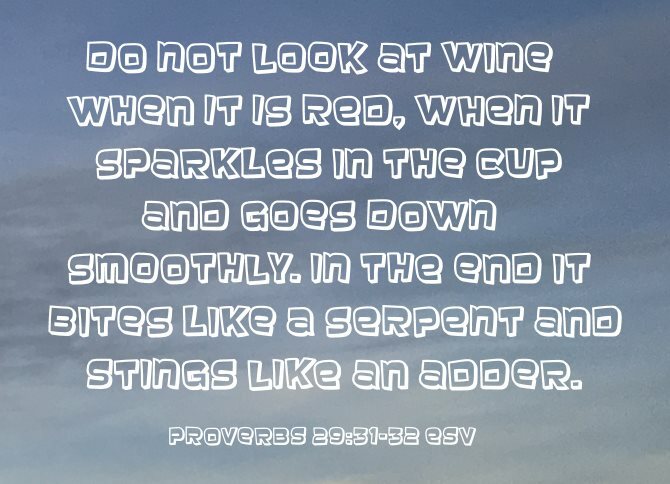 This Proverb is unmistakably clear, and to the point, but most Christians believe they are at liberty to drink all forms of alcoholic beverages and boldly defend their right. There are many scriptures that discuss the consumption of alcohol and they use them to justify their actions. The scripture "Christians" use most often to justify drinking alcohol is John 2:1-11. Yes, it is true that Jesus' first miracle was to turn water into wine. The water that Jesus used though, was the water that the Jews used for washing their feet. He didn't tell the servants to empty the pots of the filthy water, scrub them out and then fill them with clean water. No, they just filled the pots, as is, with more water and He turned it into wine. His first miracle! Since the day He poured out the Holy Ghost on the Day of Pentecost, Jesus has performed this miracle on millions upon millions of lost souls over the last 2000 years. Now, ask yourself, why would anybody want to use this miracle to justify drinking alcohol? Some other scriptures that Christians, in their folly, use to justify drinking alcohol are 1 Timothy 5:23, Ecclesiastes 9:7, Psalm 104:14-15, Deuteronomy 14:26 and Proverbs 31:6,7. What is the Cost of Drunkenness? But watch yourselves lest your hearts be weighed down with dissipation and drunkenness and cares of this life, and that day come upon you suddenly like a trap. For it will come upon all who dwell on the face of the whole earth. But stay awake at all times, praying that you may have strength to escape all these things that are going to take place, and to stand before the Son of Man (Luke 21:34-36 ESV). Why would we need any other warning about drunkenness as His return is imminent? Having said that, there are many other scriptures that tell us drunkards will go to hell - Romans 13:13, Galatians 5:21, 1 Thessalonians 5:7, 1 Corinthians 5:11; 6:10. As humans, we want to say, "I only have one to or drinks, so I never get drunk - scriptures about drunkenness do not apply to me." That is a lie from the devil that we like to tell ourselves. I know this for sure! I said that a "million" times as an alcoholic (see My Testimony). Today I thank Jesus that His grace was applied to my life after I repented. Other Scriptures that tell us "Wine is a Mocker"
There are many scriptures that warn us about the evil of alcohol - Genesis 9:20,21,22,24; 19:32,36; Isaiah 5:11,22;28:7 Jeremiah 25:27; Habakkuk 2:15; Proverbs 21:17, 23:21. From Wine is a Mocker to What is Sin?